Chad Godsey works both sides of the precision agriculture fence. He helps his father, Don, and brother, Ryan, on their 3,000-acre Godsey Farm & Ranch near Wray, Colo. 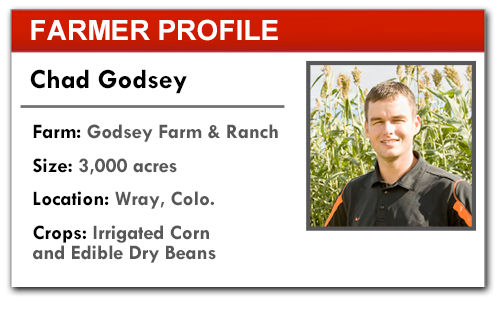 He also offers agronomic services, specializing in variable-rate seed and fertility mapping and farm-based yield trials through Godsey Precision Ag. On the farm, the Godseys use a Trimble FMX monitor with an RTK signal for spring passes with a Landoll vertical tillage machine, and then make another pass with an Orthman 12-row strip-till rig before planting. They plant with one of two 12-row John Deere 1720 planters. The Godseys apply a standard rate of starter fertilizer at planting, then variable-rate sidedress 28% or 32% UAN with a coulter implement, which uses the FMX unit and a Raven controller. At harvest, the combine’s 2600 monitor follows a SF2 signal to collect yield data. As Godsey prepares and then uploads his own and clients’ map data to controllers, he’s been frustrated by the lack of support some farmers receive from their precision farming dealers. “Farmers invest all this money and then when it comes time to use it, it doesn’t work,” he says. “In frustration, they forego using the maps. We’ve ended up troubleshooting systems for farmers so they could use our data. “Too often, precision technicians are too inexperienced or don’t have enough time in the spring. The technology is moving so fast, and I don’t think the training and support is keeping up with it. Compounding the problem is that some dealers are trying to offer even more service outside of their specialty, Godsey says, such as agronomic services on top of selling precision equipment.